Today for Crafty Thursday we're making Clue earrings. We got the idea last month when we were making the Clue Christmas ornaments. I tried different combinations of weapons and pieces and realized that most of them were too heavy to make earrings that were comfortable to wear. 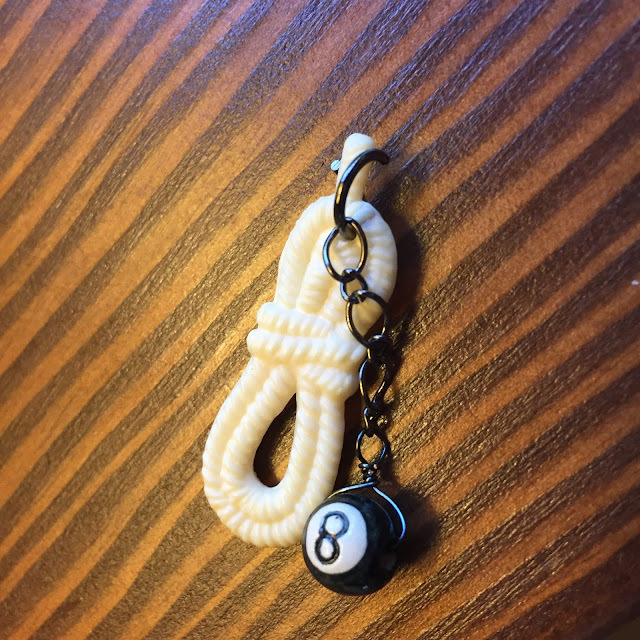 That's when I hit Etsy and found these fun beads - the lipstick and the 8 ball to make Miss Scarlett in the Billard Room with the Rope Earrings. The Rope is the lightest weapon and although you can try to use the other weapons, it makes the earrings really heavy. So let's stop complaining about uncomfortable jewelry and make some earrings. Just don't forget to comment below to be entered to win your very own pair of Clue Earrings...Of course you'll have to tell us what you're favorite Clue - weapon, killer and room - combo is. Two Rope Weapons from an old Clue Game. You can find these at flea markets and charity shops, or you can go straight to Ebay. Make a hole in your Clue Ropes. You take the push pin and press it where you want the hole. It helps to have a stack of paper or some wood underneath the rope. You need to put a hole in each rope. Put a larger o-ring through the hole. 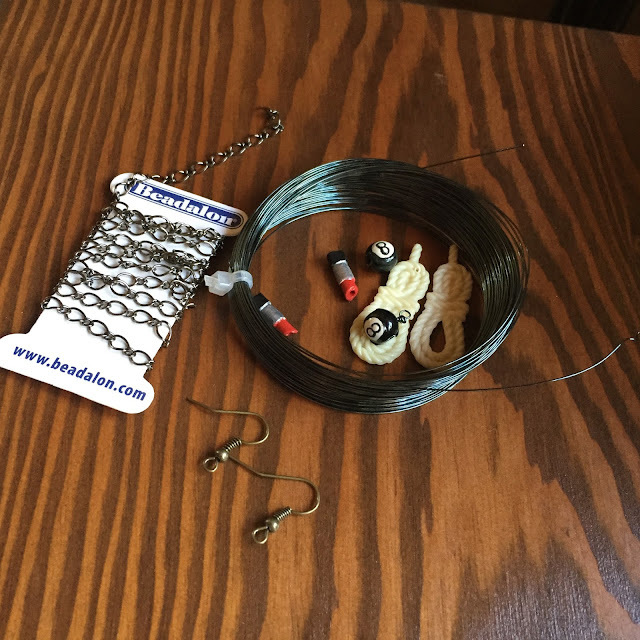 Take your 8 ball bead and your wire. Cut a four inch peice of wire. String the wire through the bead and make a triangle around the bead. Twist it at the top with your fingers. Then take your round nose pliers and make a lop close to the top of the triangle. Put the loop through one end of your chain and twist it around so it is finished. Cut the excess wire. Measure your chain to make sure the 8 ball hangs just below the rope as in the photo below when hung on the ring. Cut your chain. Repeat once for the other earring. Take your looped head pin and string it through one of your lipstick beads. 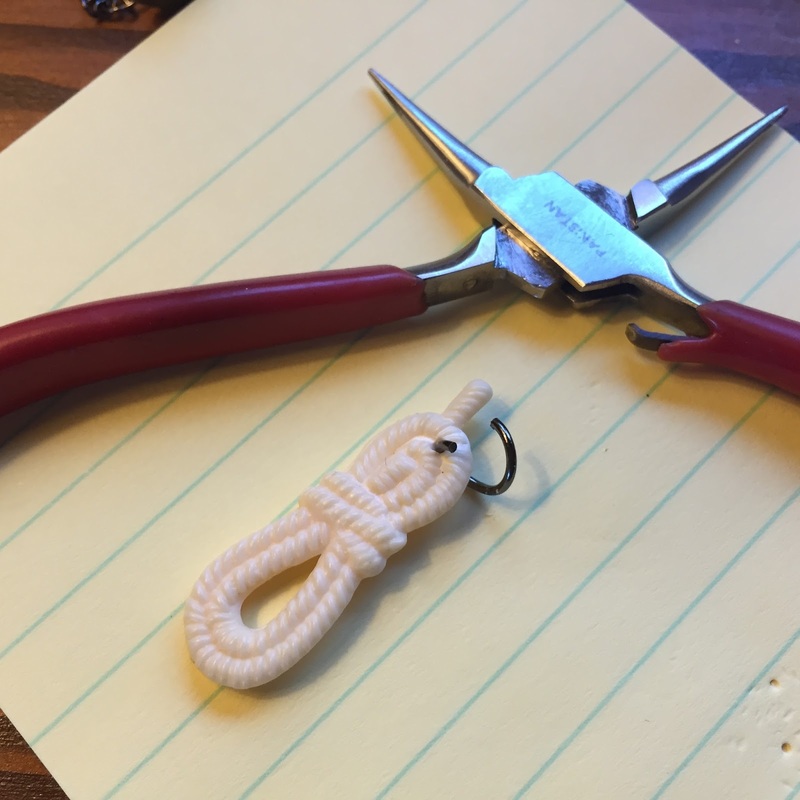 Take your round nose pliers and loop it around, like your did with the eight ball wire. The loop will prevent the lipstick bead from sliding off because the holes are large. I tried using another small bead to keep it on, but then you couldn't really tell that it was a lipstick. Hang your loop on the bigger ring so now the rope, lipstick and 8 ball are attached to one another. Close the ring. Take your smaller o-ring and open it. Loop it through your bigger ring. This will make sure the earring faces forward. Before you close that little ring, add your earring hooks. Now you can close that ring. And you're done. Don't forget to comment below to be entered in our giveaway. Just tell us your favorite Clue solving combo. Next week we'll have part two with another killer combo for you as we make Clue necklaces. Those are awesome! Thanks for the cute idea! I love this! I would choice Mrs. Peacock in the library with a revolver. Miss Scarlet in the library with a candlestick. Heavier pieces used on necklace? I will check back next Thursday. Why did I give away all those games? Professor Plum in the conservatory with a revolver. Lovely and creative. Delightful and smart idea. Mrs. White in the library with a dagger. Haha How fun! Professor Plum in the study with the lead pipe. Our winner is HoldenJ. Look for an e-mail shortly.